"Hrunting," by C.J. 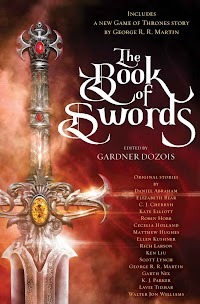 Cherryh [bio] (edited by Gardner Dozois), appeared in The Book of Swords (RSR review), published on October 10, 2017 by Bantam Books. Pro: We learn early on what a great guy he is. He attends to his grandfather’s grave. He avoids the hopeless fight with the ruffians, even though he wants to. But we learn he’s very brave indeed when he swims into Grendel’s mother’s lair. His attention to ritual and propriety is scrupulous. He honors his grandfather, Unferth, and even honors Grendel’s mother. At the end, all his sacrifices are rewarded, and it seems as though things will be better for him and his father—all without him needing to kill anyone to accomplish that. The paradox of Hrunting is that the sword guarantees a win for a hero, making it an unfair weapon and its wielder is no hero if he tries to use it. It is a sword that cannot be used. Con: Despite his goodness, despite his recent loss of his grandfather, he never engages us emotionally.